If you have read my blog or my tweets over the last few months you will know that I LOVE the Apocalips range from Rimmel. If you haven't tried them yet then shame on you, you are missing out! 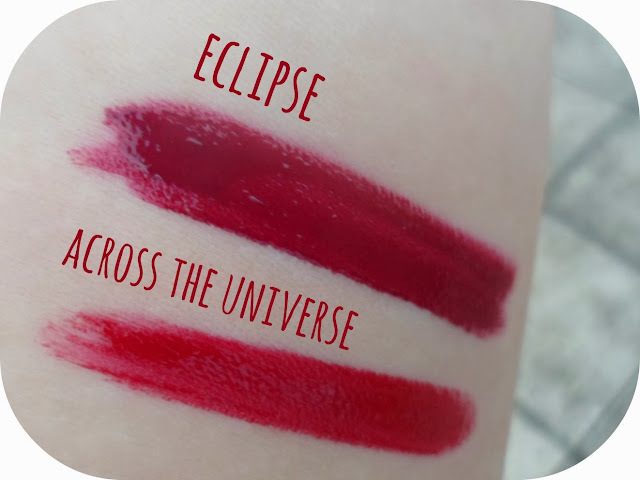 For more information and too see the original 8 shades check out my post about them that I wrote back in July! So when I heard there were new shades being released I got highly excited and had to head to Boots to invest in more of the collection! I picked these 2 shades of the lip lacquer as they look perfect for Autumn/Winter. I've been buying alot of darker, warmer colours recently and have really fallen in love with them! As you've probably read in my other posts in previous years I haven't had the confidence to wear darker, vampy colours but now I am all for it and feel much more confident in wearing bolder shades! 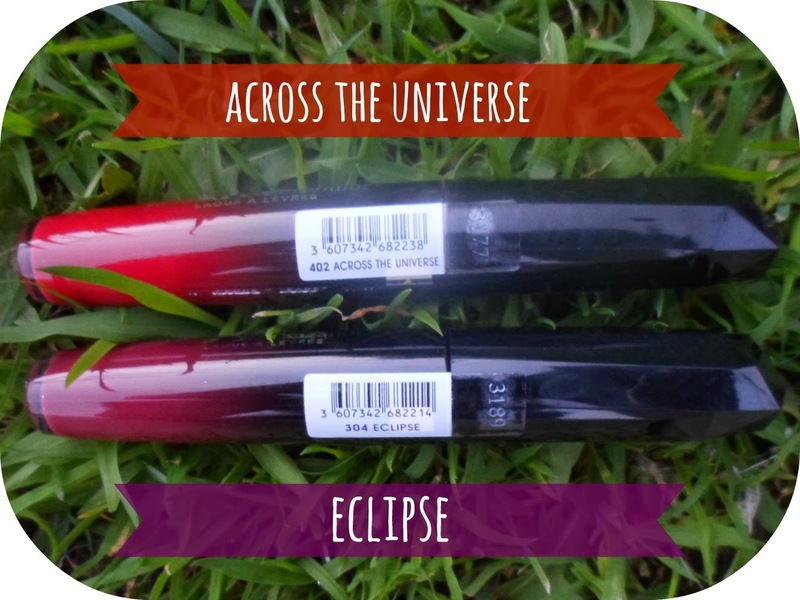 Across The Universe is a deep red and Eclipse is a dark purple shade - both perfect for A/W! I've been wearing these alot and know they are going to be used just as much as the rest of my collection which I have been living in over the summer! They are £6.49 each and I think they are worth every penny! The formula for these are just perfect, as thick and pigmented as a lipstick (they are basically a liquid lipstick!) and they stay on for hours and hours. They have a really creamy texture with no stickiness and in my opinion are the best of both worlds. I cannot recommend them enough! Have you tried any of the Apocalips range yet? I give Rimmel 10/10 for them! Ah I still need to try these, gorgeous shades! Arrgggh I have been dying to buy these! I can only get them online as Rimmel is nowhere where I live :'( I always eye them up but then I can't be bothered to pay the postage or wait so long to get them. I think I'm going to have to now. 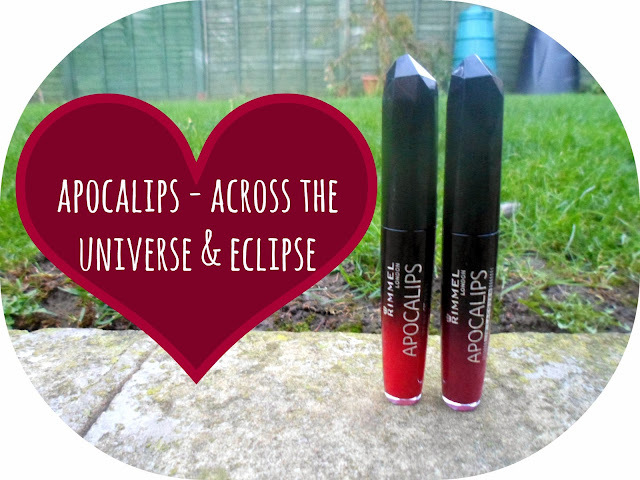 I haven't tried any of the Apocalips range but I really really should with all these new shades coming out! These two look gorgeous, especially Eclipse! Really want to try these shades - especially eclipse! Being lusting over Rimmel Apocalips for a LONG while now D: But I just can't justify the price tag! I LOVE them! Eclipse looks a stunner.